Disneyland, Hong Kong, originally uploaded by tgtwb. 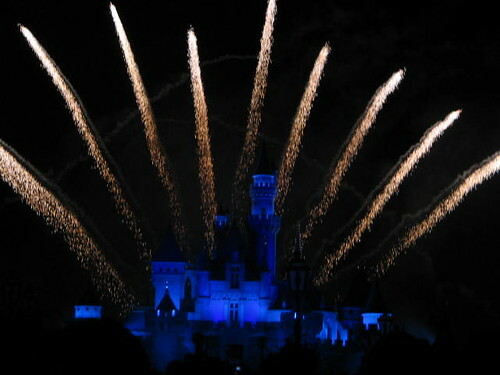 This was taken at Hong Kong Disneyland. The fireworks was (and probably still is) the final act of the day - like a premiere before closing time. At that time, the fireworks display started at about 8pm (HKG Time). Hong Kong Disneyland is a small 100 acres theme park. My advice is to just set aside 1 day for a visit. I believe they have 2 days, 3 days pass but you need only 1 because of its small size. To get there, you either take a train, a bus, a cab from the city or stay over for the night at the Hollywood Hotel (where we stayed!) and have everything shaped like good ol' Mickey's head - from bed posts to the pool, even your pasta!!! Hope, originally uploaded by tgtwb. 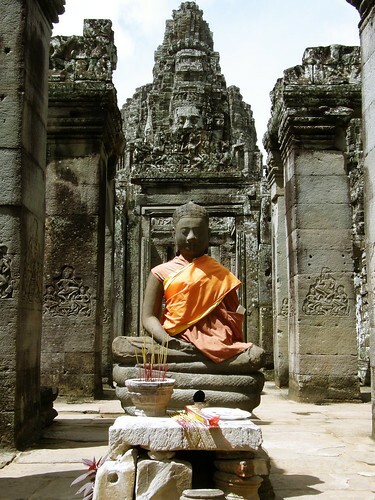 The Bayon is another one of those famous temples of Angkor in Cambodia. As you know, the Bayon temple's unique feature are the massive sculptures of stone faces on several towers (i have a t-shirt with only the Bayon temple on it!). It is also one of those temples where EVERYONE wants a picture taken with the 3 faces (facing South, East and West). So if you are there, be sure to snap fast or face the wrath of evil eyes from other travellers! Budapest, Hungary, originally uploaded by tgtwb. A day at the museum in Budapest, Hungary. Anyway, these soldiers were pretty intimidating. Almost life-like... just without soul and flesh. 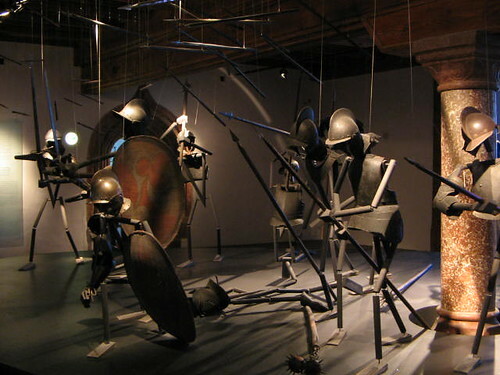 They had other medieval exhibits around as well. Very fascinating! PS: Avoid Europe (and esp. Hungary) in June and July... Its bleedin' hot and in July especially, is their Formula-1 Racing season. If you are a fan, then by all means. But if you are not, hotel rooms will cost you an arm, a leg and both your front and back pockets too. We paid GBP 99 per night, at a former monastery, 15 minutes bus ride into city centre! Daylight robbery? Indeed!!! 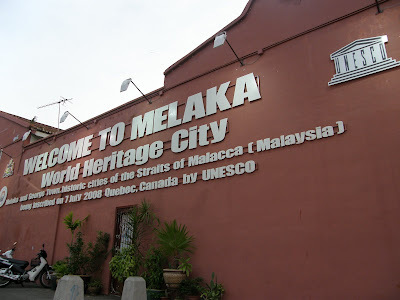 Part II of Malacca - JONKER Walk! So this is really slow, late and almost unacceptable! But! I'm going to post them up anyway ;) and for those who wish to visit Malacca (or Melaka) anytime soon, over the weekends or on convoy, DO CHECK OUT JONKER! 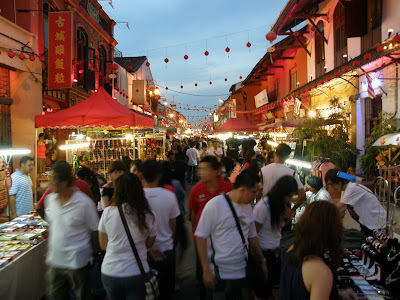 I must say that Jonker is a little overhyped for a stretch of "pasar malam" (night market) styled shopping district but what i love about it is the idea of being truly Malaccan. You know, colonial shop houses, red laterns, Baba-Nyonya still speaking in unique-baba-only-Malay-English, the smell of aromatic "chicken rice" and fried kuih lobak (Carrot Cake) and the grinding of the ice for a bowl of Chendol. Yes, it has its own set of charm. 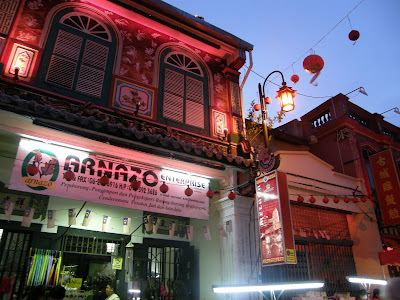 The Nyonya Baba inspired shophouses. Quaint ain't it? It looked really gorgeous in the day and even better at night! 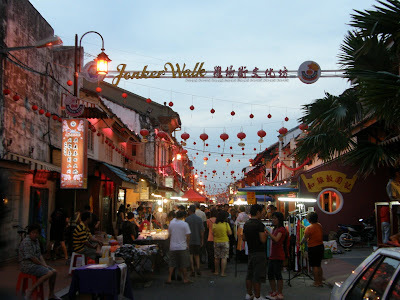 Another view of Jonker Walk. Its really quite pleasant to take a stroll down the entire street and just "look-see look-see" (or window shop) all the odds and ends displayed so neatly on makeshift table stalls. 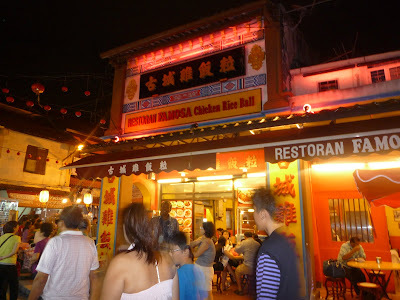 That night, we wanted to try out the famed Chicken Rice Balls from the halal outlet of Famosa Chicken Rice Balls. But we were told that their halal outlet is ONLY available at the Malacca Bus Terminal (now called Central). Personally, TTT didn't think that the ChickyBs (short for Chicken Rice Balls, Cubbies-style!) are out-of-this-world extraordinary (like what most people claimed). But now that we have tried it, we know. 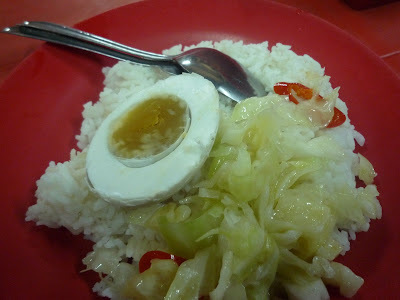 Yes it was tasty and all (who doesn't like chicken rice!) but it was ordinary. This is the "non-halal" outlet we found on Jonker, along one of the many smaller lanes. 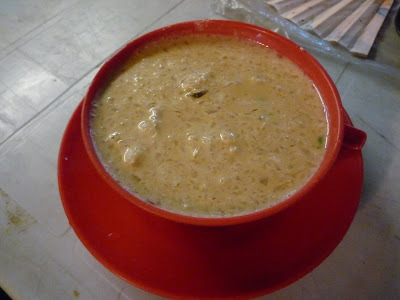 Oh no trip to Malacca will be COMPLETE if you do not try the Chendol. 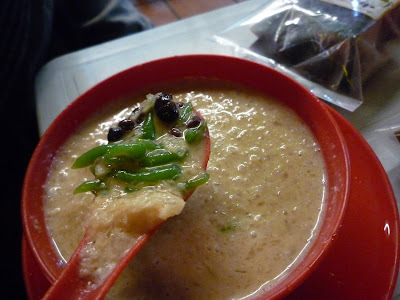 What is Chendol? Chendol is a traditional dessert that is oh-so-sweet concoction of creamy coconut milk, green starched noodles, red beans, palm sugar, all topped with shaven ice. We got ours here from a shop along Jonker. You cannot miss it. Its near the start of the north entrance, owned by a couple of hubby grinds the ice and aunty-wife, who is very eloquent and friendly. "You try you try my Chendol. Gua cakap, lu tak boleh jumpa Chendol macam gua punya. Mine is the best!"... Indeed! It was nice and sweet!! And so we asked around for the best Asam Pedas in Malacca. Shamelessly, we chit chatted with police officers (or better known as The Tourists Police! ), passerbys and taxi drivers to ask for tips on where to find the best Asam Pedas . There were mixed reviews of different restaurants but only one name was synonymous with all those who were interviewed - Hajah Mona Asam Pedas. Here's how you eat them with, Mona-style: White rice, salted eggs and simple, understated fried cabbages. Its really quite amazing that they do this - so you can concentrate on the Asam Pedas and not be too bogged down by the other dishes. Very clever. 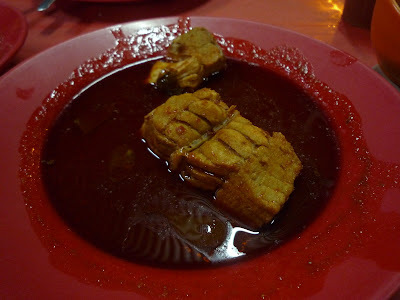 The common asam pedas with ikan pari (Stingray). Cubbies ordered this. Meebops and her ever loving relationship with anything fatty and greasy and tasty, She Like! 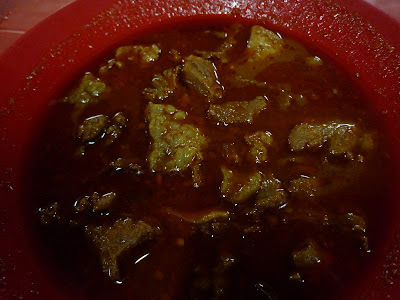 She ordered the asam pedas tetel, or scraps and spares from beef or mutton. 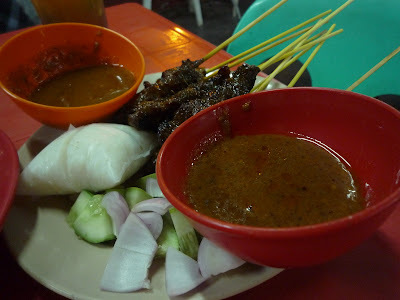 A plate of satay. Who doesn't know satay? Everybody does! And we love 'em! Oh this is seriously good satay peeps. Tender, sweet, aromatic, with just the right chunk of fat snugged in between the well-marinated meat... Very very nice :) Not exactly from HM but a stall "attached" to it. My advice is, skip the malls unless you really have to. You can see nothing there but same old mall-rat culture back home. The deal is to put on your good walking shoes and WALK! OH! 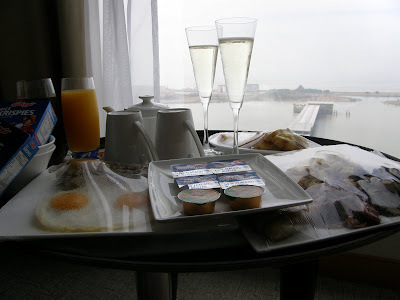 Before i go, i didn't tell you what we had for breakfast in Holiday Inn, did i? "Meebops! Smell this... *sniff* *sniff* Don't you think its...*sniff* *sniff* ... alcohol? *sniff* *sniff*"
If it isn't too much trouble for you, travel down to JB and take a bus down to Malacca. Not only it’s cheaper (RM 20 one way compared to S$38 in Singapore), its also faster and far more effective. Besides, all those travel - makes the journey even more interesting! You don't need too many days in Malacca. A 2 or 3 day trip should suffice - one day shopping, one day "gluttoning" and one day sightseeing! You can do the RM 5 "hop on hop off" double deck bus that will take you around Malacca in 30 minutes! Keep your ticket stub! Its free transport for you for the entire day! Try the Chendol at the stall opposite the Red Church / Red Square, (Jalan Laksamana) sold by an Indian-Muslim man (former Mangosteen Chendol). TTT like it plain but you can also do it with red beans, and is a wonderful thirst quencher on a hot day! I tried it when i was young and never ever forget its sweet taste tickling my tongue to this day! Must try the fresh Roasted Chestnut at Jonker Street. Just the right dose of sweetness. 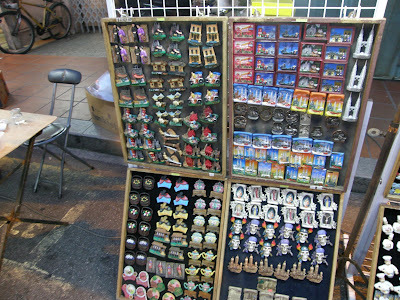 Buy a kilogram (RM 10) and snack while "window shopping" odds and ends sold along Jonker Walk. And mind you, i am an advocate for low prices. I think all airlines should be cheaper than it was before (indeed, my wish came true...) and i still think Air Asia is better than Tiger Airways in many ways (which should have been long defunct). But there are numerous reasons why i hate this red airline and why they are really, really pushing me into becoming an EX-AIR ASIA passenger. I was on AK704 flight bound for Kuala Lumpur. You see, whenever i travel on Air Asia, the flight is almost always delayed. 5 minutes, 10 minutes, 30... whatever the schedule, wherever the destination, there will always be delays. And not that i am unfazed of that fact but i suppose i am a little more tolerant of such circumstance. Yes, sometimes its the weather conditions, sometimes its just air traffic. But i've been on so many carriers before, both budget and full-service. The award still goes to you. Oh... and to Garuda too. You guys are almost at par in terms of scheduling. In this instance, AK704 was 45 minutes off scheduled. We only took off close to 3pm. For some reason, i have forgotten to take my pen with me when i left the office for KL that day. Oh! I'd usually have it with me. You know, when on business, you never know when you'll need one. So i am quite helpless without a pen. I will usually have no problem asking for one from one of those Batik-clad ladies on one of those conventional airlines. They'll usually pass it to me for use (which i return to them promptly after use of course!) within 5 - 10 minutes. Very efficient. On board AK704, I asked for a simple humble pen that i can use to fill up my immigration and health declaration forms. Sure, you can argue that i can fill it up at the terminal upon arriving. But the flight had been delayed and you know how notorious KL airports are when it comes to immigration. You can be queueing for quite a long time before you finally get your turn. So i'm just trying to cut the hassle really. And so i asked young girl in red skirt if i could borrow a pen, any pen. Girl looked at me, top to toe, disinterested and said, "Let me check first...". So we took off and all was jolly good. The take-off was smooth, everyone happy. But i still didn't get my pen. So i waited. I waited and waited and was listening to my songs playing in my iPod. Time did pass and though i was painfully aware that for a pen, this was taking way too long, i didn't want to make a big fuss out of it. Creating a ruckus is just not my style. 25 minutes... 30 minutes... And i turned behind to see if little miss red skirt lost her way to my place for that pen. But sadly no, Miss Hostess in red short mini skirt was talking and laughing to her other short-skirted colleagues. So i waited for her conversation to finish, a good 5 minutes later, as we were descending, she aimlessly walked down the aisle, just to make sure that everything was in order. So i said excuse me, what happened to the pen? With an attitude (i stress this), she said, "Gave the pen to other passengers already, that's why...". You see, now its no longer the pen that mattered. It was her attitude. Absolutely priceless. I was gnawing my cheeks out because i was so angry. You gave the pen to others. Sure. Its not your responsibility to lend me a pen. Sure. I'm flying on Air Asia and paid less than what others will pay for for the same route on other airlines. Sure. But what could she have done? Simply walk up to me and say sorry, we have no more pens available for your use. And i would've understand. I am not that petty honestly. Yes sometimes i can get carried away with pettiness but i am usually quite civil. Oh then i heard the announcement made on the intercom. I can't help but snort when the stewardess had the audacity to say, "Air Asia was voted World's Best Low-Cost Airline in 2009 by 15 mil people around the world. Thank you for making our dream possible." By 15 million who? Stakeholders? World's Best is at best, a joke. A fellow traveller to Melbourne once asked TTT which airline we took to fly to Melbourne. And so we said we took Air Asia X - when they were giving away supposedly "free tickets" but ended up charging us for more S$750 each. The traveller was shocked, naturally (we did too...) and said that she only paid S$421 for a full service flight on Emirates. Our jaw almost dropped to the floor. And she added, "No point la flying on Air Asia... they make you pay for everything. And in the end, when you calculate, it's the same like flying on conventional airlines. Might as well fly on big planes complete with meals, 30kg baggage allowance and larger seats..."
I asked for a pen. Do i have to pay for this too? SIDEBAR: Try googling "love, hate Air Asia" and you'll get a good mix of reactions. But the common ground is, you either love it or you simply hate it. I've never been a strong lover or hater for anything... i'd work perfectly as a Diplomat. But you know, they really have pushed me to the other end of the spectrum. And even though i can foresee that i can't break-away from travelling on Air Asia for business (because of the economic crunch, they took away my Krisflyer flying privilege...), i am definitely converted - from "lover of cheap airfares" to "hate that cheap red airline who compromised service and time". So do fly with a consistent airline - Cheap flights, Cheap service, Cheap everything! I made it. WOOHOO!!! I passed my driving test. 2nd attempt and i got 16 points for it. Look to right, left and check blindspot turning right, look left, right and check blindspot turning left, signal early and stay in your lane UNLESS overtaking :) Good tips? Sure, it came from me! Ha! Ha! And then we're back and of course, with not a single cent in my pocket, i reckon we better start saving again for our future use. And so we came back to this little island called home TRF. So i counted and counted and counted... this month's earnings to a total of S$147.50! That's like the biggest amount ever! Unbelievable.